Why does baby flat head occur? The infant skull is soft and pliable to allow birth to occur and for rapid brain growth. The skull changes shape rapidly as the brain grows. If the head rests on a flat surface the brain cannot push the skull out in that direction. It compensates by growing out in areas not under pressure and this makes the flat spot more pronounced. Young babies have poor head control. It is easier for them to rest their heads on the flat spot once it has developed. Most babies will have a perfectly normal head shape at birth. A very small number will have some deformation due to intrauterine constriction against the pelvis or ribs. Twins are at higher risk. A small number have a tender area following the birth process and will avoid pressure on that spot. This can occur with Ventouse suction caps, some instrumentation and a cephalohaematoma. Some babies have a torticollis or tight neck muscles. Your baby should be able to freely bring their chin to their shoulder. A tight neck muscle will prevent the head turning and a flat spot will develop. Most torticollis cases respond to home physiotherapy. Are there other causes of unusual head shape? 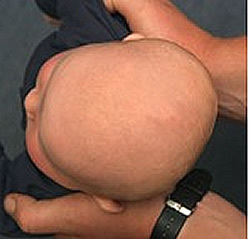 Early fusion of the skull joints (craniosynostosis) produces very characteristic shapes depending on the suture involved. It is usually easy to differentiate from deformational causes. 1. The back of the head is flat, usually on one side but sometimes symmetrically. 2. The ear on the flat side is pushed further forward than the other ear when viewed from on top. This ear may also appear more prominent. However both ears will appear to be the same height when viewed from the front. 3. The forehead on the flat side will gradually also start to protrude more when viewed from the top. 4. There is a compensatory bulge out the back on the opposite side of the flat area where the brain continues to grow out. In symmetrically flat heads this bulge occurs on both sides. Is baby flat head dangerous? Skull deformation has no known effects on intellectual development. This has been looked at in multiple studies. Some ancient cultures bound heads to change the shape. Headgear may need to be altered eg padding of bicycle helmets. Severe variations of normal may have psychosocial consequences in some individuals. What can I do to improve my babies head shape? 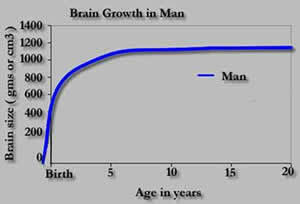 You must keep all weight off the flat area 24 hours a day for up to one year to allow the brain to grow out. This will only be successful if your baby is still on the steep part of the brain growth curve. However even after 18 months of age some improvement will be seen. How can I keep weight off the flat area? What works will be different for each child and will change as their development progresses. The following suggestions may help. ensure they can freely turn their head. Start physio if the neck is stiff. -Do not put them to sleep with the head on the flat spot. Turn the head to one side. -If possible sleep on alternating sides but ensure baby cannot accidentally role onto their front. -Turn the cot so the head is turned towards toys and people entering the room. -Turn a rolled cloth behind their back and another under the opposite knee. -A Velcro safe-T sleep device can help hold position in younger children. -A wedge under the mattress to tilt it to one side. - Sit more upright in baggies and car seats. The weight of the head passes through the neck rather than the flat spot. Is it safe to sleep my child on its side? Unconscious adults are put on their side in the recovery position to keep their tongue out of their airway. This position is safe in children provided they cannot roll onto their front onto a soft pillow and be unable to roll back to their side. This depends on the age of the child. Do helmets have a role? Helmets are passive devices that keep weight of the flat area. If parents are keeping all weight off the flat area, there is no advantage in using a helmet. Helmets may cause skin irritation and need to need to be regularly adjusted. Our craniofacial programme does not use helmets but are relaxed if parents we see wish to use them. Does surgery have a role? We operate on 1- 2% of children we see who are severely deformed and in whom hair growth will not disguise the deformity. Surgery is only considered after conservative measures have failed and after approximately 18 months of age when brain growth is slowing. The skull can be dissembled and reshaped. One procedure is the occipital swap, swapping to two back halves of the skull. An example of a case is shown on the media page, "Sophie's Choice". An implant can be put on the outside of the skull beneath the scalp to disguise the shape. This should only be done in older children. Click to download the Baby Flat Head information sheet.